Win your bird's trust early. Parakeets are social animals; the most important thing in their lives is their flock, and you are probably an honorary member. One that flies away is likely to want to return home sooner or later, and chances are good that you can get your bird to come home with persuasion. Note which direction he flew off in. This information may be useful later if he does not return in short order. Take his cage outside, if it is small enough. Secure all the doors first if you have another parakeet and place a second cage next to it, if you have one. Spread his favorite treats on the floor of the open cage. Call his name or whistle or make whatever sound you usually make when calling your bird or just playing with him. 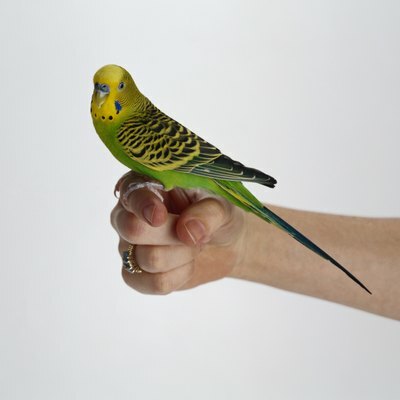 If you have another parakeet, encourage that bird to vocalize, perhaps by talking yourself. If the escapee is nearby, he may well respond to your call or his mate’s call. Prepare a “lost parakeet” flyer on your computer, preferably with a photo of the bird in question and print copies to post around your area, especially the direction he flew in. Contact local animal sanctuaries, animal control, zoos or bird parks if applicable and the local police to notify them that you have lost a parakeet. Also, tell all your neighbors and advice them to remain calm and call you the minute they spot the bird. Don’t forget to include your telephone number on the flyer. Pet birds remain friendly and he might well approach somebody else. Collect his cage and his favorite treats and toys once he’s been located and take them with you. Ask other people to keep their distance and make sure their children and pets do the same. He might be enjoying himself or he might already be scared. Either way, a stranger approaching is liable to make him fly off again. Place the cage and treats somewhere visible to the parakeet. Wedge the door open and tie a piece of string to it so you can pull it shut once he’s back in. If you think your presence will reassure and attract him, position yourself next to the cage and call him occasionally. If he still has a tendency to be nervous around you, position yourself a short distance away. Hiding might be counterproductive though – some parakeets are aware that this is something predators do. Hold out a familiar toy or perch if he is sitting not far from you. He might be persuaded to walk onto it, allowing you to return him to his cage. Call him, rattle a bag of seeds or whistle again as dusk approaches. He’ll be settling down to roost now and you won’t have another chance to entice him back until the morning. Keep in touch with animal control and local animal sanctuaries if you were unable to locate him. Many lost birds do turn up eventually. If his cage is too big to lug around, use his carrier instead or a small spare cage outfitted with familiar toys and perches. A reward offer on the flyer might be helpful, especially if your parakeet has been missing for more than a day. Good Bird Inc. recommends not putting details of your pet’s band number on the flyer or other publicity material. This could encourage the dishonest to remove the band before selling the bird, meaning that if he is caught, you might never find him. On the same note, keep an eye on birds for sale in local on and offline advertising. If you think somebody has found and is selling your bird, it is up to you whether you involve the police or just buy him. However, it is not advisable to confront the seller with accusations of theft. Budgie Place: The Budgie and Parakeet Place FAQ Pages -- How Do I Catch a Lost Budgie? Can Parakeets Make a Nest in a Cage? What Happens if a Cockatiel Flies Away?